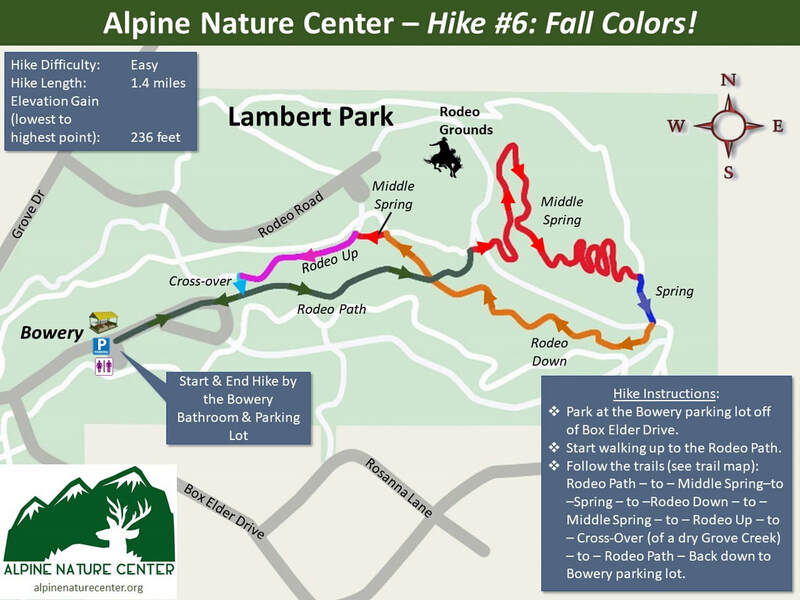 Each month, starting in April 2018 the Alpine Nature Center, is posting suggested nature hikes in Lambert Park that feature different flowers, trees or bushes in bloom. Hike with friends, family or by yourself as you commune with nature and learn more about the natural world around you. Print out the guides below. They contain a trail map and pictures of plants to look for. The hike guides will be available all through the season, but the flowers may only be viewable during the month in which a new hike is posted. Badges can only be earned before the next new hike is published during the following month. 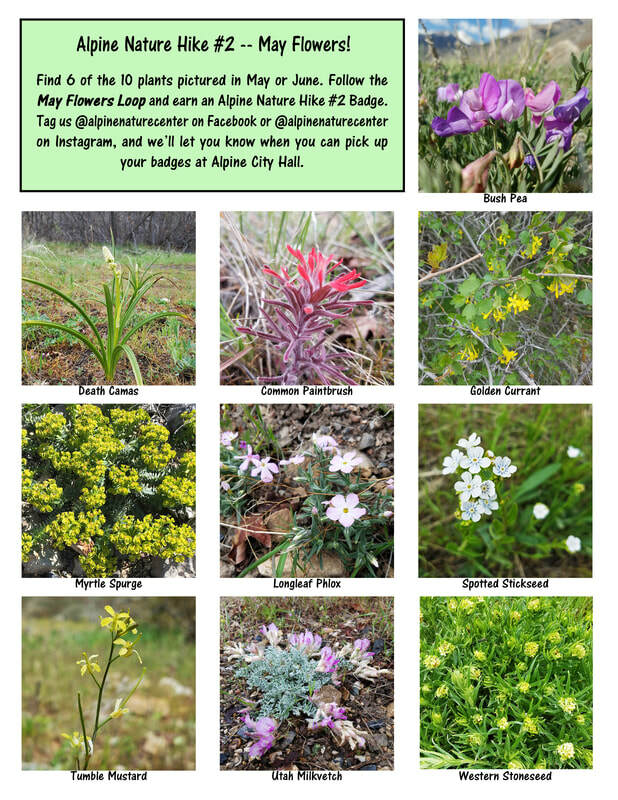 Earn a badge for completing each hike and identifying 6 of the 10 plants on the list. COLLECT ALL SIX BADGES! Tag us on Facebook (@alpinenaturecenter) or hashtag us on Instagram (#alpinenaturecenter) after you finish the hike. Be sure and mention the name of the hike in your post! Pick up your badges when you are notified that they are available at Alpine City Hall. Please don't pick the flowers! Take only pictures. ALPINE NATURE HIKE #6 -- Fall Colors! 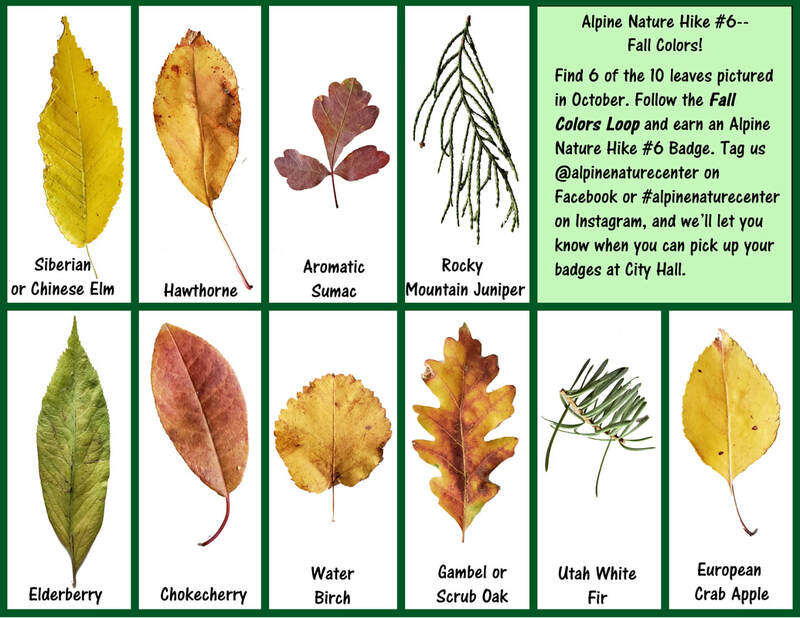 Download the map and picture pages of Alpine Nature Hike #6, Fall Colors! here! Follow the Fall Colors! hike for 1.4 miles, identifying trees and leaves along the way! Collect your badges at Alpine City Hall after you notify us through Facebook or Instagram that you have completed the hike! Have fun! Alpine nature Hike #5 -- Dog Days of August! 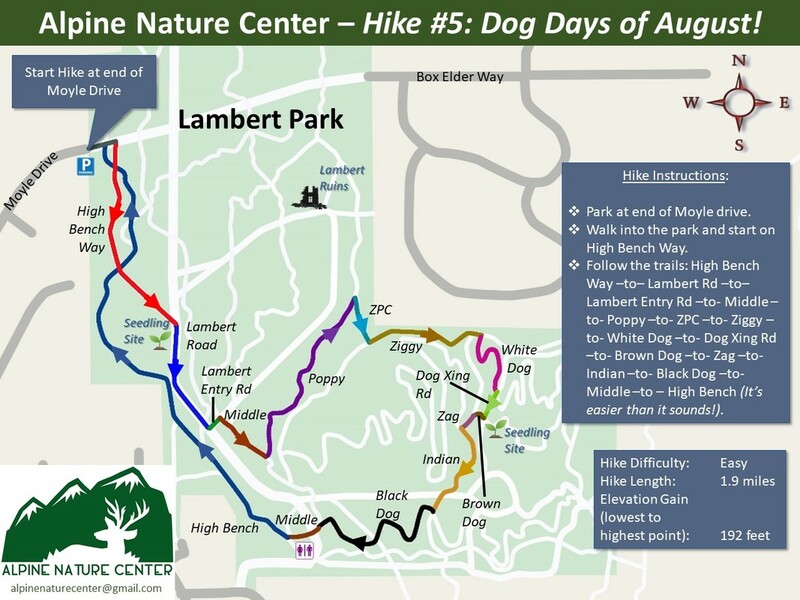 Download the map and picture pages of Alpine Nature Hike #5, Dog Days of August! here! Follow the Dog Days of August! 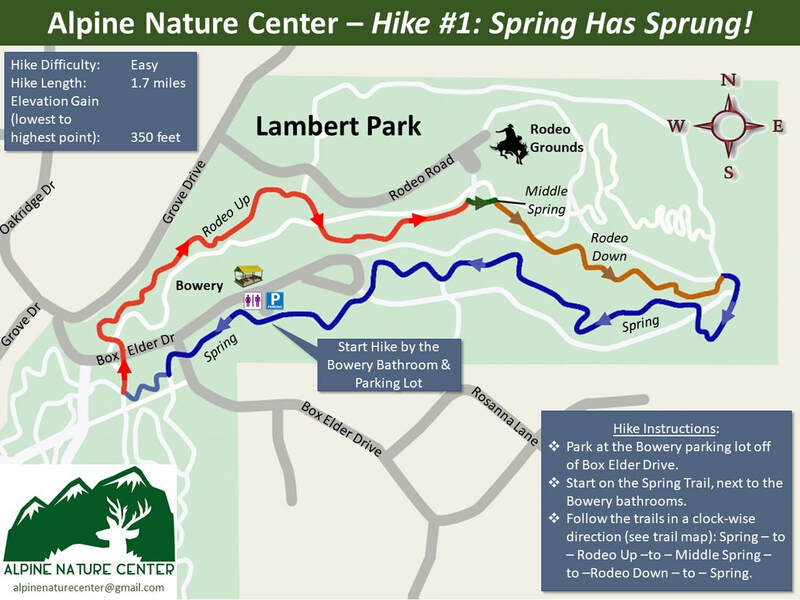 hike for 1.9 miles, identifying flowers and trees along the way! Collect your badges at Alpine City Hall after you notify us through Facebook or Instagram that you have completed the hike! Have fun! 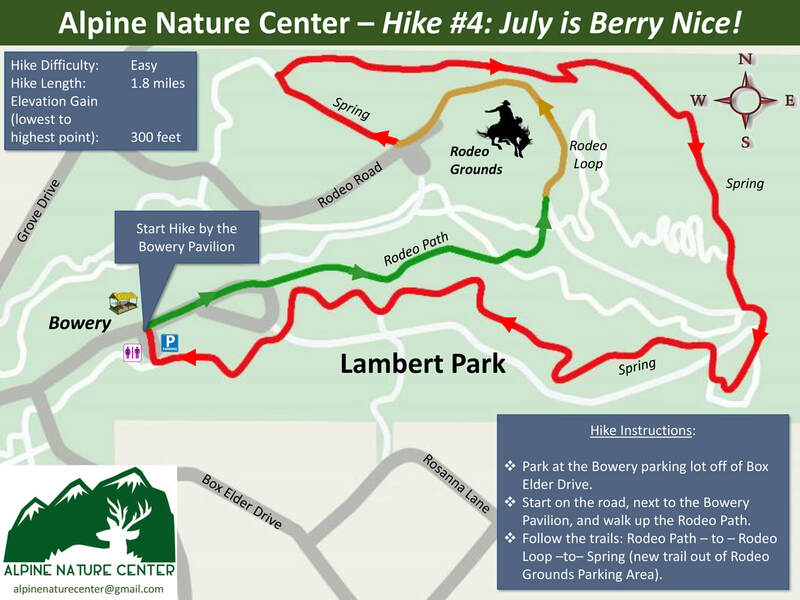 ALPINE NATURE HIKE #4 -- july is berry nice! 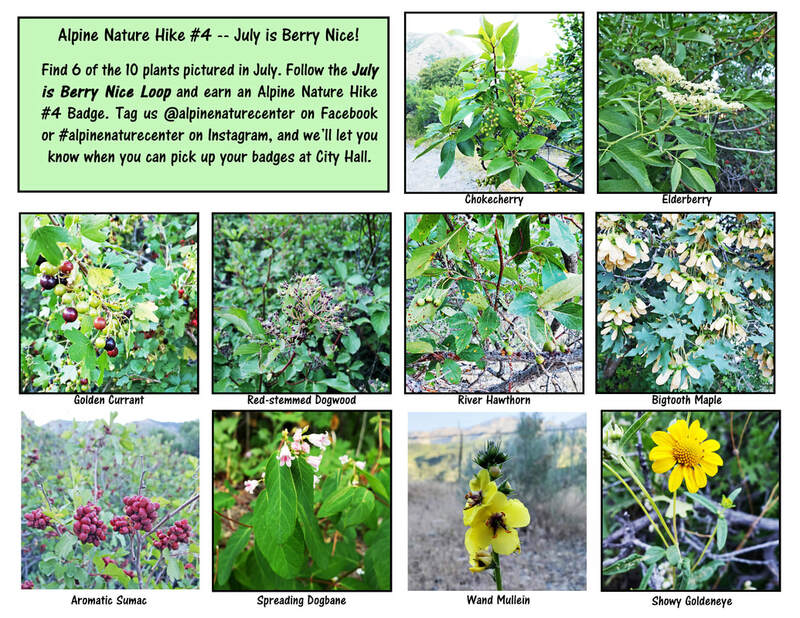 Download the map and picture pages of Alpine Nature Hike #4, July is Berry Nice! here! Follow the July is Berry Nice! hike for 1.8 miles, identifying flowers and trees along the way! Collect your badges at Alpine City Hall after you notify us through Facebook or Instagram that you have completed the hike! Have fun! 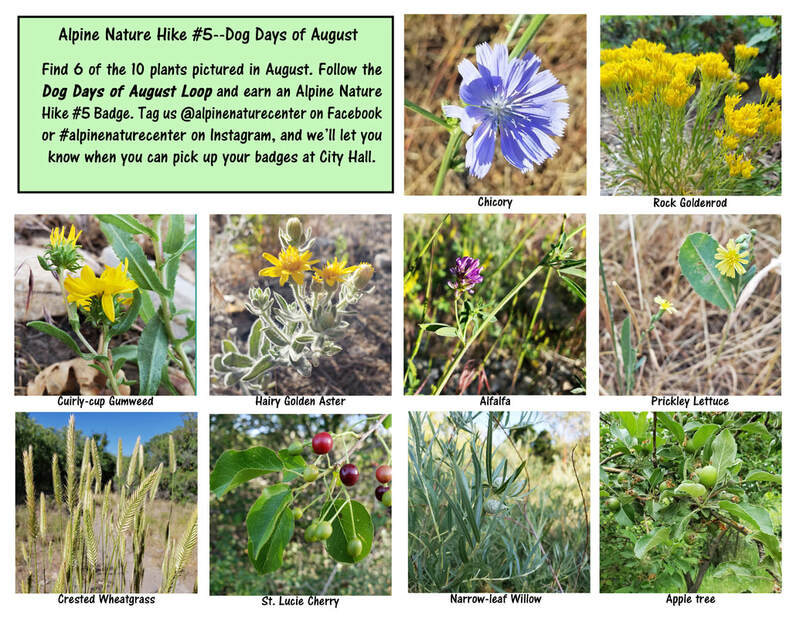 ALPINE NATURE HIKE #3 -- June's a poppin'! 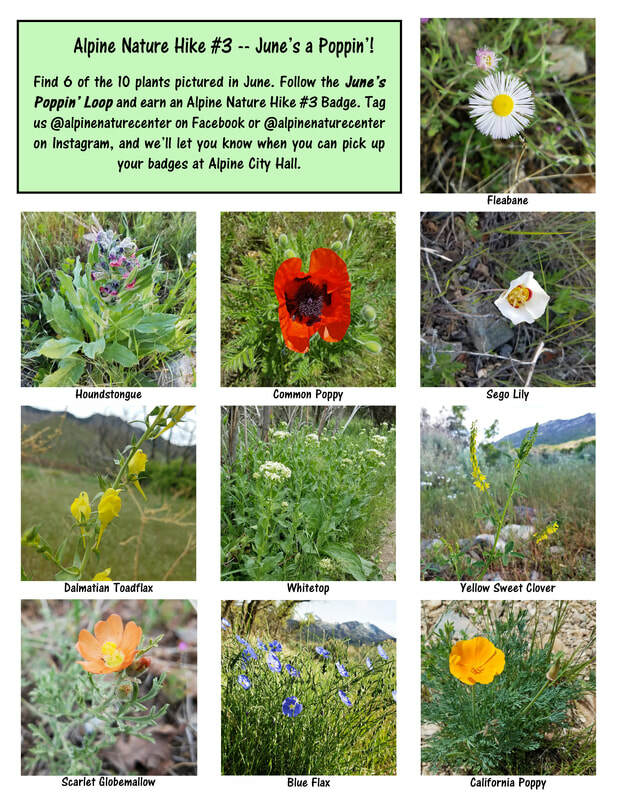 Download the map and picture pages of Alpine Nature Hike #3, June's a Poppin'! here! Follow the June's a Poppin'! hike for 2 miles, identifying flowers and trees along the way! Collect your badges at Alpine City Hall after you notify us through Facebook or Instagram that you have completed the hike! Have fun! ALPINE NATURE HIKE #2 -- May Flowers! 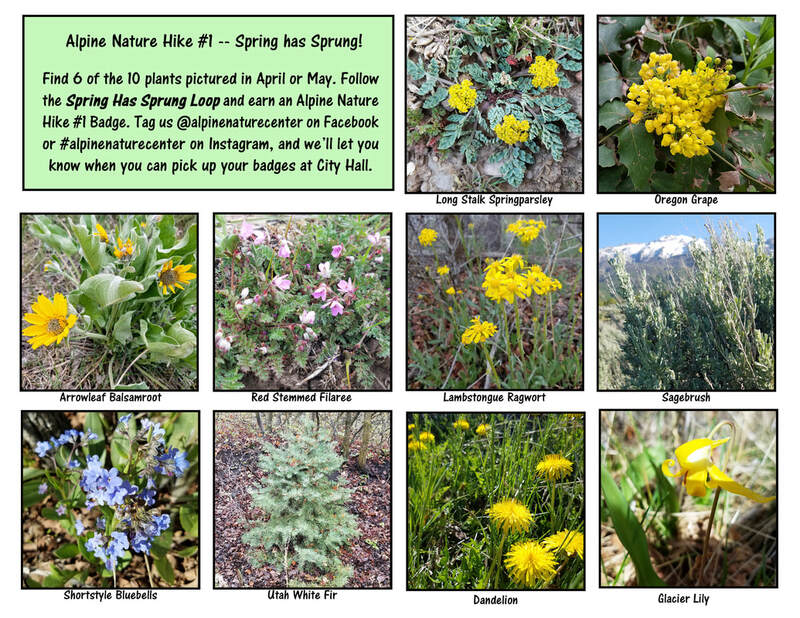 Download the map and picture pages of Alpine Nature Hike #2, May Flowers! here! Follow the May Flowers Loop for 2.3 miles, identifying flowers and trees along the way! Collect your badges at Alpine City Hall after you notify us through Facebook or Instagram that you have completed the hike! Have fun! Alpine Nature Hike #1 -- Spring has sprung! Download the map and picture pages of the first Alpine Nature Hike here! 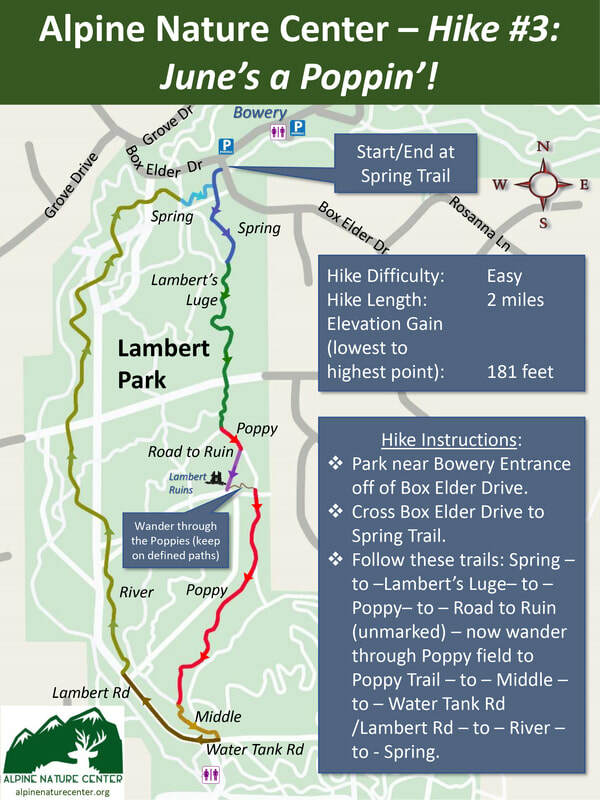 Follow the Spring Has Sprung Loop for 1.7 miles, identifying flowers and trees along the way! Collect your badges at Alpine City Hall after you notify us through Facebook or Instagram that you have completed the hike! Have fun!